This simple, beautiful hash comes together in minutes, and is much lighter than its potato counterpart. And so flexible. I had some extra bacon sitting around in my fridge, but use whatever protein you prefer (prosciutto, pancetta, leftover roast chicken or beef, pulled pork, or beef would be just as delicious). Hot sauce or barbecue sauce adds some great, smokey flavour to the hash—I used one of my favourite hot sauce, Supicucu's Diablo's Fuego. Top off the hash with a fried egg, and serve with some toast if you like. Heat a small saute pan over medium heat. Add the bacon and cook until crispy, about 5 to 6 minutes. Remove the bacon to a plate lined with paper towel, and remove the excess bacon fat, leaving about 1 tablespoon in the pan. Return the pan to the heat and add the shallots; cook until softened, about 5 minutes. 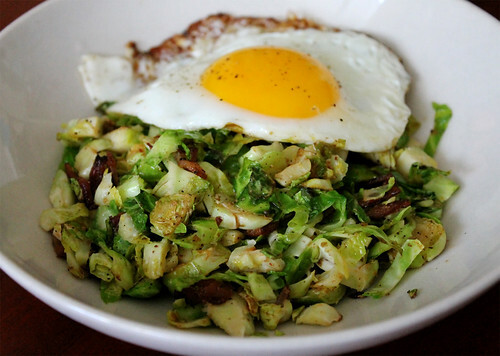 Add the brussels sprouts, season with a little salt and pepper, and sauteed until just cooked, about 3 to 4 minutes. Add the cooked bacon back into the pan and add the hot sauce or barbecue sauce, if using; toss to incorporate, cooking for another minute. Adjust the seasoning if you need to. Serve the hash on a plate and top with a fried egg. Enjoy!